Malayalam is first language for my parents, my husband and his parents. I normally think in Hindi and consider it as my first language. But with a score of 5-1, I ignore my Malayalam skills at my own peril. Under normal circumstances, Malayalam should have been my first language - but I grew up in Delhi, at the centre of Hindi-heartland. Even though I grew up listening to Malayalam at home, I did not pay enough attention to be able to converse in it fluently. I never considered it as a big deal until I got married to a true-blue-mallu. Being in Kerala for the wedding and meeting relatives tested my Malayalam language skills for the first time – rest as they say, is history. The word about the new bride with a funny accent and a flair for gaffe spread like Chikungunya ! Not an excuse, but an additional context to non-Malayalam speakers (that’s about 6.5 billion as of this morning) - Malayalam has 51 alphabets compared to a measly 26 in English, it can get quite tricky at times. Difficult indeed, I am dreading the thought of teaching Malayalam to Smera !! Join the club Sangeeta.All of us born and brought up in delhi are victims of this.Atleast when asked whether you can speak Malayalam you have not answered korach korach (barking) when you meant to say kuruch kuruch (a little). Trust me you are not alone.Can you imagine what is going to happen when my true blue punjabi hubby and my punju-mallu daughter and a highly incompetent mallu like me will soon visit Kerala? Nice one, Swapna Di - knowing that I am not alone makes me feel slightly better!! And good luck with your upcoming trip to Kerala...I am sure it will be fun! It happens! In work place I got many mallu friends and I know little bit of Malayalam as being in a neighborhood state. When I speak with them they laugh at me and of-course they correct me as well. One think I really liked in mallus that they are very friendly in nature. Jennie thank you ... You've made my day!! Tejeesh - your comment just made my day ..
hey Sangeeta...I found your blog on bloggers.com and I so understand your predicament at this...even I was supposed to have my first language as telugu but unfortunately, I prefer to think in hindi and even converse in Hindi :D God knows what will happen when I get married!!! If you ask me, my malayalam has worked as an ice-breaker in sticky situations .. 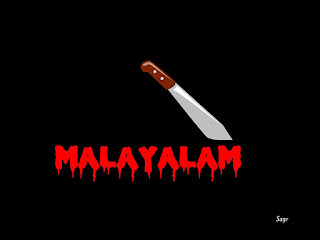 The greatest difficulty with Malayalam(for who is not well-versed with it, ie,) is that even the slightest change in pronunciation will result in change of meaning -and one ends up saying exactly the opposite / unconnected words!!! I can empathize with you!! My elder son is like you. Having spent the first few years of his life time in North India, he still has not mastered the nuances of Malayalam. He still struggles with ra(soft)& RA, la & LA...etc. This is hilarious. I can completely understand what you must have gone through! It's nothing to be ashamed about not being pure or fluent in Malayalam. Don't let that run over your pride for the mallu culture, which I admit it's a pet peeve when mallus scrutinize for not speaking malayalam properly/fluently..etc. That's not good but is a whole different topic dealing with the malayalee mentality, which I admit I hate. My cousin was born in Delhi and he speaks broken malayalam. I'm US born and I can speak conversational malayalam..I never speak it at home, and won't because of very serious conflicts regarding that I won't speak at all, however when I am India people tell I speak well though sometimes I don't know the meanings to some words, but no issues since I have English speaking relatives to help. If you really want to learn, you can do so by putting your mind to it and also people, who will do it in a lovingly way, to help you. You will get there! Anonymous - Thank you for stopping by and I am glad that you enjoyed reading this and could relate to yourself with me ..
November (pronuonced as "NOVember" instead of "noVEMber"
Same boat. But now I can speak much better Malayalam. One needs to practice. As an alternative difficult words or words with pronunciation problems can be spoken in ENGLISH. It gives your Malayalam an added edge. The choice should be theirs, but as parents we should introduce it lovingly (not force, criticize them for not speaking) and make sure we don't act like typical Indian parents who shove our dreams onto our kids. With this you'll be surprised. Only because I know a distant relative who never grew up speaking Malayalam at home, nor she understood when spoken. Her parents decided to let her choose her identity enjoy her childhood and did not shove down the mallu culture down her throat (compared to other parents). Her relatives, who are not the typical malayalee were very loving towards her and respected her for who she is. And because of that she fell in love with Kerala and its culture and now speaks, reads and writes Malayalam flawlessly. Your kids may have the same view if you make it into something positive, so you never know. You can always learn a language anytime when you heart desires it. Don't listen to that "it's too late to learn" bullcrap ! On the other hand, those very conservative, traditional, "holier than art thou" parents who ridicule, and hurt their kids' self esteem will fail. I have seen with one not so friendly family (I myself don't like them) who forced their culture down their throats, ridiculed and try to make them "naadan" and their kids want NOTHING to do with mallu culture. You let your kids be themselves and respect them w/o looking at other kids, you will be surprised what your kids can achieve. Unfortunately in Kerala now, I just feel the people there are getting worse and worse and I feel sorry for most of the children there. No offense, but many of us are questioning it. Can dirty shoes make anyone happy? Why true love is like Wifi? My girl turns 3 !! Silly Saturdays: Yet another self-goal ! © Sangeeta Reghu Nair @Sangrywords, 2011. Ethereal theme. Theme images by 5ugarless. Powered by Blogger.